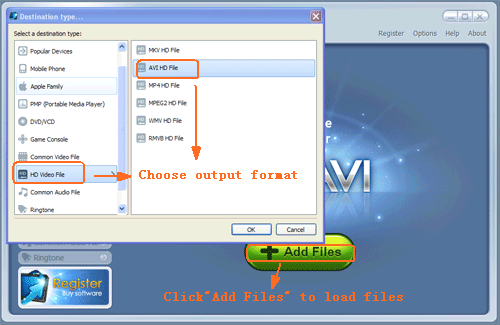 How to batch convert video files with WinAVI? 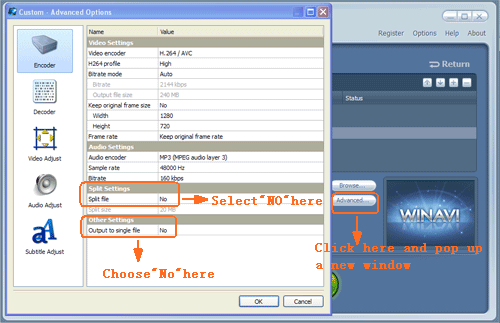 If you are confused about this feature of WinAVI, this tutorial will give you much more helps for making full use of this function by using either WinAVI All In One Converter or WinAVI Video Converter ( above version 11.0). WinAVI All In one Converter is a powerful batch video converter, not only make you easily add subtitle, split video, but also support batch convert video files even merge video files into one. Using the batch video conversion feature, you can easily save your time and do not have to spend a long time selecting every single file individually to convert. It allows you to highlight a whole batch of files and either convert the lot or make a converted copy of them. Now please follow these below steps. 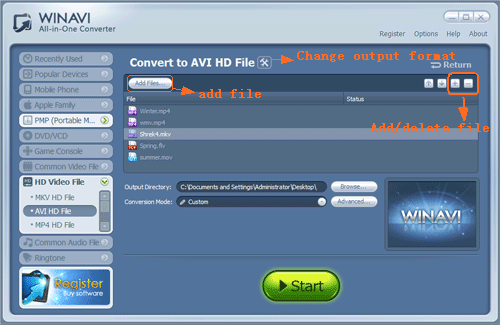 Step 1: Free download WinAVI All In One Converter, Install and then run it. Step 2: Load multi-files. Click the green "Add files" button and please press "Shift" while clicking two distant files with the mouse. And then all the files between these two ones will be selected. Or press "Ctrl" while clicking the files that you want to select with the mouse,and then the files that have been clicked will be selected. Then click"Open"and the program will pop up to relevant window for choosing output format. 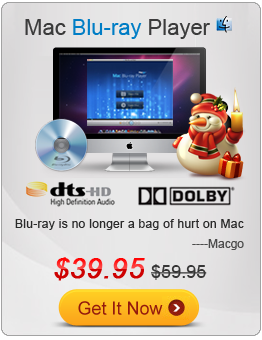 Here we choose "AVI HD" as an example. Step 3: When the output format setting has been done, please click "OK" and the program will switch to a new interface that can let you add more video files or delete your unwanted files that you have selected before. If you want to add more files, please click "add files" or "plus" symbol on this interface. If want to delete one or more selected files, please click "minus" symbol.If you want to reload all the new video files, please click "Return" on the right top of the interface. Step 4: Click "Advanced" and a new "Encoder" menu window will pop up. Please both choose "NO" on "Split file" and "No" on "Output to single file". Then click "Ok" to complete advanced settings. Step 5: When all are ready, please click "Start" button to convert. If you want to cancel the converting, please click "Stop" button or click the close button on the right corner of the interface. Then you can click "Open output directory" and find the batch converted videos files. And if all are successful as this result, that means you have learnt how to batch convert video files with WinAVI All In One Converter.